Spider veins, named so due to their spider-like configuration, are small, dilated blood vessels that primarily appear on the face and legs. They sometimes cause pain and a burning sensation. While further scientific study is needed to confirm the efficacy of alternative remedies in the treatment of spider veins, herbalists recommend witch hazel to relieve discomfort and inflammation associated with the condition. Consult with your physician before attempting herbal remedies at home. Witch hazel, otherwise known as hamamelis, winterbloom and spotted adler is a woodland tree indigenous to Canada and the eastern region of the United States. The perennial shrub grows to a height of 15 feet and bears distinctive yellow flowers in the fall, followed by brown fruit capsules. Witch hazel's leaves and gray-brown bark, harvested and dried during autumn, are used in tinctures for a variety of medicinal purposes. Native Americans first recognized the therapeutic value of witch hazel in the 1600s. According to Herbs2000.com, they introduced the plant as a poultice for swelling and irritation to early European settlers in the 18th century. Its use as an astringent soon spread quickly to Europe and beyond. Distilled witch hazel, the same product millions of people use today, became popular in the middle of the 19th century for skin conditions and hemorrhoids. In an 1887 issue of "The British Medical Journal," Dr. John V. Shoemaker, Professor of Dermatology in the Medico-Chirurgical College of Philadelphia, touted witch hazel's powerful astringent, anti-inflammatory and haemostatic qualities in treating swollen veins. Shoemaker stated, "It is a remedy par excellence in disease due to a relaxed condition of the venous and capillary walls." Tannins and volatile oils, the principal active ingredients in witch hazel, work as vasoconstrictors, constricting tiny spider veins under the skin's surface. According to the University of Michigan Health System, German pharmacological studies indicate that witch hazel strengthens veins and acts as an anti-inflammatory. Tannins also account for witch hazel's astringent action which help tighten distended veins and repair their normal structure. Moreover, Dr. Varro E. Tyler, author of "Honest Herbal," states that Commission E, a government-appointed team of German scientists, recognizes witch hazel's positive antioxidant, antiseptic and anti-inflammatory properties in treating varicose veins. The plant's key constituents help shrink tissue and act as mild sedatives to relieve pain and discomfort associated with spider veins. Available in creams, teas and tinctures, the University of Maryland Medical Center suggests applying cold compresses of witch hazel and yarrow tea to your affected areas to temporarily relieve pain and burning. Soak a washcloth with distilled witch hazel and yarrow tea, and apply it twice daily. Witch hazel can cause stomach upset, nausea, vomiting, constipation and liver damage when ingested. 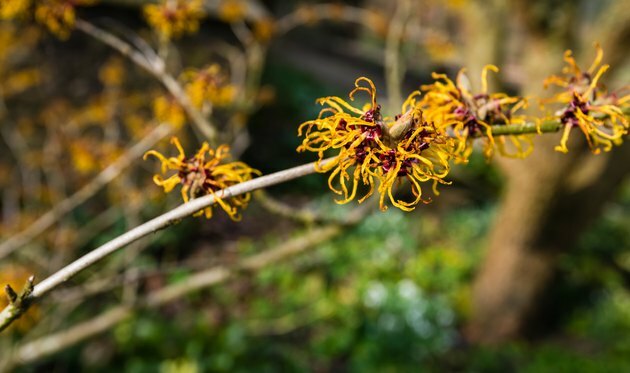 The University of Michigan Health System warns that internal use of witch hazel may interfere with the absorption of medications containing alkaloids. Due to witch hazel's high tannin content, avoid using it over prolonged periods of time. Do not use commercially produced witch hazel water internally.